Home » Blog & News » Hurricane Harvey Floods: How Can I Help? On August 25, Category 4 Hurricane Harvey made landfall on the Gulf Coast of Texas. In the days since, an astounding amount of rain has fallen on the area, leading to catastrophic flooding—and has not yet let up. Some areas will see upwards of 50 inches of rain before the storm finally moves out of the vicinity. At least 22 people have died, thousands have been displaced from their homes and/or have had their homes destroyed, and hundreds of thousands have lost power. As of this morning the tropical storm is over the Texas-Louisiana border and not expected to move out until Wednesday evening; it is expected it will take days if not weeks for the flood waters to recede from the hardest hit areas. At a moment like this, the first question for many is “How can I help?” For donors who want to make a difference, here’s what you need to know. Resist the impulse to give items; giving money can have more impact. Many people are moved to send items such as food, clothes, or blankets to affected areas. While well-intentioned, such donations frequently don’t match what is actually needed and can risk taxing precious logistics and storage capacity. Large, often national or international, organizations can tap into networks and supply chains that allow them to bring resources quickly and at high volume. For example, Save the Children is on the ground responding to the needs of children and their families by providing shelters with portable cribs, strollers and hygiene supplies for children. They also opened their first child-friendly space on Monday, and plan to open more in the coming days. Americares’ response team on is connecting with local health centers, free clinics and other responders in Texas to identify needs. They are performing emergency deliveries of water and medication and developing plans to provide ongoing access to medicine, relief supplies, and basic health care for those affected. Although they may take longer to identify, local, often smaller, organizations have knowledge and networks that allow them to quickly assess changing priorities and get help to many of the most vulnerable groups faster. Examples in Texas include local food banks in and around the disaster zone, such as Houston Food Bank, Food Bank of Corpus Christi, Food Bank of the Golden Crescent, Central Texas Food Bank, and San Antonio Food Bank. Donors can give money directly to these local food banks, or designate funding through Feeding Texas. Houston Mayor Sylvester Turner has established the Hurricane Harvey Relief Fund, housed at the Greater Houston Community Foundation, to accept flood relief donations. Since those affected by a disaster are the experts on their own needs, local funds like these can often have the greatest impact. Consider giving beyond the first stage of this disaster. Right now, and until the rain and flooding stops, attention is focused on search and rescue, and addressing the immediate needs and security of survivors. After these immediate, basic needs are met, the people of Texas will need continued support to rebuild and recover. Each phase brings different needs and different players who are best-positioned to provide help. Although giving in disaster situations tends to decline after the first few days, often funders can have the biggest impact by paying attention long after the initial headlines fade. With this in mind, several organizations, including GlobalGiving, the United Way of Greater Houston, and the Center for Disaster Philanthropy, have set up pooled funds, which can channel money to local grantees once medium- and longer-term needs have become clearer (GlobalGiving and the United Way will also fund short-term costs such as first-responder support). 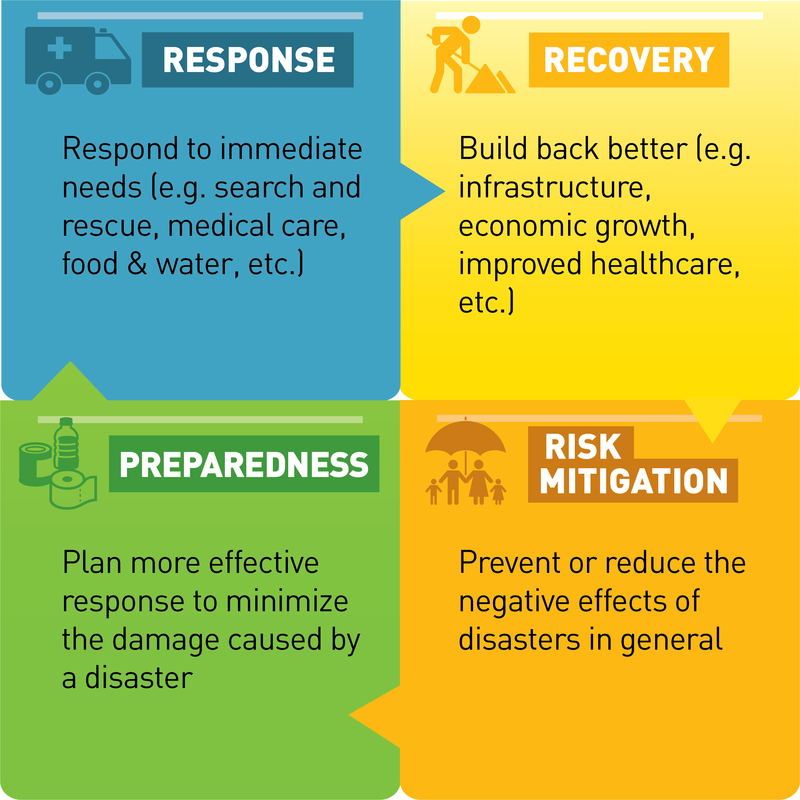 The Center for Disaster Philanthropy specifically does not disburse funds until after conducting an on-the-ground needs assessment three months post-disaster. The situation in the Greater Houston area will continue to evolve. As more information becomes available on how philanthropy can help in the aftermath of Hurricane Harvey, we will update our guidance.